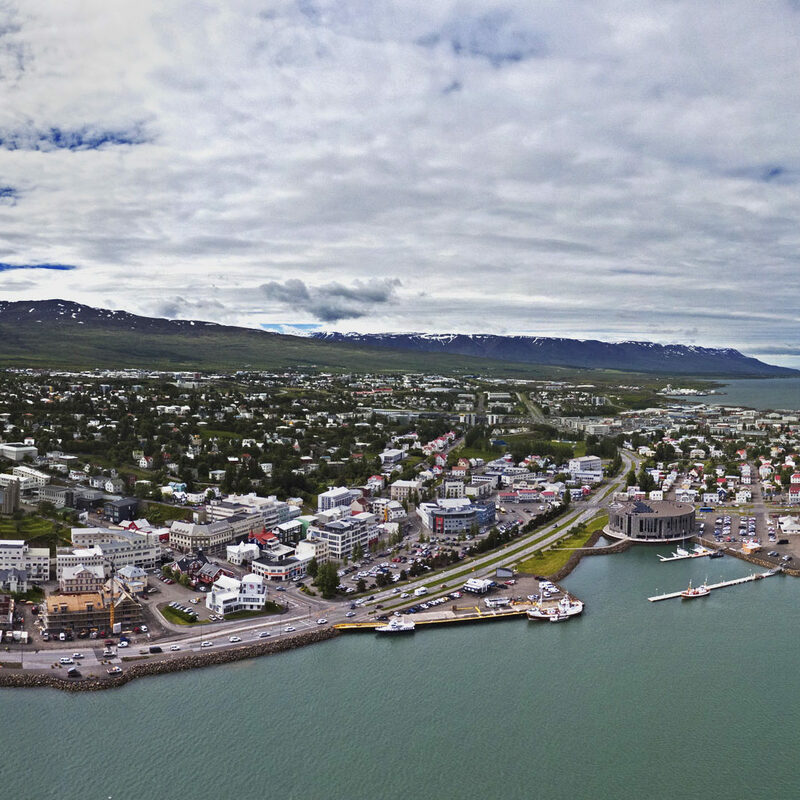 SinfoniaNord is located in Akureyri, a center of industry, trade and culture in northern Iceland. The town rests at the head of the fjord Eyjarfjörður, surrounded by high mountains, shielding the town from strong winds creating a mild climate throughout the year. The town has exceptional facilities and is located closely to many of Iceland’s most significant natural, cultural and historical attractions. Transportation to Akureyri from Reykjavik is simple as the International Airport is open all year round with four to nine daily flights and good connections to other destinations in Iceland. The landscape adjacent to SinfoniaNord is diverse, and sceneries are lush with luxuriant flora, overlooking the fjord. Akureyri is famed for a range of visual contrasts, such as ice, woods, stunning views over the fjord, awe-inspiring mountains, dramatic history and a peaceful atmosphere. Attributes that can be a breath of fresh air for those seeking to refresh their creative powers. Within the town limits there are many interesting recreational areas and hiking paths. Visit local villages and national parks, enjoy northern light tours, golf in the midnight sun, try the best mountain biking paths in the country, go skiing in the winter or tour the local restaurants. Dining in Akureyri is a food lover’s dream, as restaurants have access to the purest, natural Icelandic ingredients. Fresh produce is grown organically in greenhouses and meat and dairy products are free of additives and growth hormones. Fish is caught daily from the Atlantic ocean, which restaurants get fresh every morning. Furthermore, Akureyri is popular due to its adjacency to Lake Mývatn. Mývatn is one of the country’s most visited attraction, due to its stunning beauty, geothermal activity, diverse birdlife and many surrounding natural phenomenons. One of which is Dettifoss, the most powerful waterfall in Europe. Should you choose to explore more of Iceland, there are countless of locations and experiences at your disposal. Transport is convenient, so getting from one location to another is easy. We can help you plan the perfect trip so that you will feel refreshed, inspired and ready to return to the studio. During the day, Akureyri is a tranquil town, but if you have a desire to explore the Icelandic music scene, you are in luck. On Friday and Saturday the town center takes on a new persona as bars and music venues come to life. Each place has unique features and all age groups should find a place that fits their vibe. The inhabitants of Akureyri are music lovers and know how to enjoy themselves, whether it’s in the summer sun or during cozy winter months. Perhaps it’s for these reasons that Icelanders have a reputation as naturally gifted musicians. Many claim that the reason for the countries unusual amount of gifted musicians is partly due inspiring sceneries, abundant natural resources, as well a rich literary history. Others consider it to be the result of dark, solemn Icelandic winters, forcing its inhabitants inside, close to their instruments, for extended periods of time. They say isolation has made Icelandic people tilted toward introvertism, causing them to continuously develop their potential for creativity and artistry. Whichever the cause, Iceland has a significant amount of world renowned musical artists per capita, such as Björk, Sigur Rós, Atli Örvarsson, the late Jóhann Jóhannson, Emiliana Torrini, Ólafur Arnalds and Of Monsters and Men to name a few. These artists represent the wide array of talent and musical styles to be found blossoming in Iceland. © SinfoniaNord, 2019. All rights reserved.